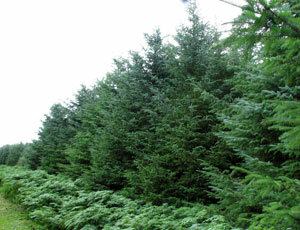 About 70% of Britain's commercial tree plantations are Sitka Spruce. The Forestry Commission have been planting sitka since as far back as the 1930s both because it is able to survive in inhospitable peaty conditions and because sitka grows fast and produces good quality timber. 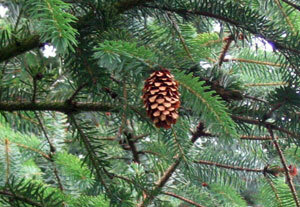 Botanically called Picea sitchensis, sitka spruce is most easily identified by the "three p's": it has a pointed crown, its leaves (needles) are on pegs and it has pendant cones. The history of sitka is interesting: during an expedition to the west coast of North America in the 1790s led by Captain George Vancouver, this spruce was identified by the ship's botanist, Archibald Menzies who was particularly keen on sitka's anti-scurvy properties. For example spruce beer was discovered to be an antidote to scurvy. 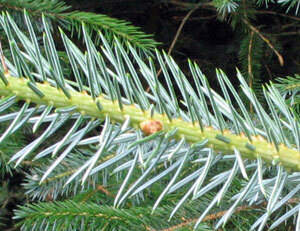 However it was another 30-40 years before sitka spruce was first taken back to Britain. Seeds were brought over by the famous David Douglas (after whom Douglas fir is named). This botanist introduced over 50 new trees to Britain following his 1823 trip to North America, including sitka spruce. Douglas had a short but very eventful life and died in 1834 at the age of 36 - quite a contrast to sitka spruce's first finder, Archibald Menzies, who lived to the age of 98. Both were Scotsmen whose first jobs were as gardeners and were both critical for the identification and importation of this tree to the UK. Sitka spruce has a high strength to weight ratio which makes it ideal for building work but for the same reason it has also been used for aeroplanes and was used by the Wright brothers and Bleriot. Later aeroplanes such as the Sopwith Camel (WW1) and the Mosquito (WW2) also used sitka spruce in their construction. But sitka is also used in pulp form in rayon, high quality paper, explosives and even in nappies. Piano, violin and guitar makers use sitka spruce for sounding boards and on a more industrial level sitka spruce is pulped for particle board. Sitka has also been used for pit props and ladders but as far as a woodland owner is concerned it is reassuring to know that it burns without the need for much seasoning. Why is spruce not always popular? Many people dislike the landscape aspect of sitka spruce plantations in the UK, seeing them as too uniform and representing the invasion of a foreign army of trees. This perception may be changing partly because fewer sitka spruce are now planted in lowland areas, giving way to native deciduous species, but also because in many spruce plantations the trees are now getting beyond their "ugly duckling" stage. Another change that is affecting some forests is a a greater use of continuous cover woodland management techniques that retain a canopy of tree cover and avoid clear felling. Some people worry about large areas of uniform planting because such 'monocultures' are more susceptible to catastrophic risks from diseases and pest damage. The experience of Thetford forest with red band needle blight in its pine is an example, but a disease or insect which severely damaged sitka spruce would potentially spread very widely in the UK and with enormously bad economic and other consequences. Sitka's branches are arranged in wholes which means they come out of the main stem at regular intervals in a ring of shoots. The twigs of the young tree do not hang down and are pinkish brown in colour. The bark is very thin and smooth when sitka spruce is young though it develops scaly plates with age and becomes brown and purplish (slightly reminiscent of humans!). The cones are orange-brown and about 5-10cm long and usually found in the top quarter of the tree once it is about 20 years old. 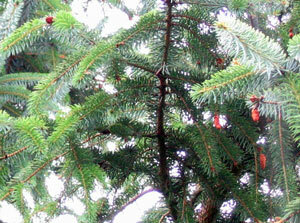 There are male and female trees and the cones occur only on the females whilst the male sitkas have dark red flowers. Picea sitchensis, as it is technically known, is named after the Latin "picis" (meaning pitch or sap) and after the American town of Sitka in Alaska where the tree has existed for hundreds of years. Actually they are so widespread in Alaska that it is the official state tree. 'Spruce' in English originally meant anything Prussian and there are lots of other types of spruce trees in Prussia (formerly North East Germany). Many owners of smaller woodlands who have areas of sitka spruce are progressively replacing these with deciduous trees, but it is worth considering thinning the coniferous trees with a view to keeping at least some sitka to retain groups of these magnificent evergreens which can live for over 500 years. We have mixed woodland here, with small pockets of Conifer, including sitca spruce, before the addition of the conifers, we had no siskin here at all, now we have flocks of them, so always a good idea to have evergreens somewhere in the woodland for balance and habitat.